We plugged a phone charger into the cigarette lighter socket in the front of the van. It’s a 25 Amp socket. The end broke off the charger inside the socket. A fuse saved us from a potential melt-down. 25 amps of short-circuiting 12 volt electricity creates a lot of heat. If the fuse hadn’t blown, by the time we’d realized there was a problem and disconnected the battery there might not have been much left of the central console in the dash. Mercedes did a nice job of protecting their electrical system. We decided to do an equally safe job of the electrical stuff we added to the vehicle. Pretty much all the safety-related components in the electrical system come from Blue Sea Systems. They make marine-grade 12- and 24-volt electrical distribution panels, mains breakers, and other electrical components for boats. Their products are very high quality, but like everything else that has the word “marine” in its name, they cost about twice as much as regular domestic components. What makes them so appealing, though, is that they are designed to be used in confined spaces inside moving vehicles. Their DC voltage equipment is also very heavy-duty. DC switches need to be designed differently than mains AC switches, because the high current can weld the switch contacts together if they don’t have the right gap to stop arcing. We designed our system with switches to isolate each part. The battery can be completely switched “off” so it doesn’t give power to any part of the system. The solar panels can be switched off so they don’t give power to the charger. The DC distribution panel can be switched off so it doesn’t power any of the DC loads. The incoming 120 volt AC shore power can be switched off at a 30 Amp breaker, and the 120 volt AC power generated by the inverter can be switched off at a 30 amp breaker on the AC distribution panel. Basically, if you switch all of these switches to their “off” position, no electricity should be flowing in the van. Switches are how you turn the power off manually, but what if there’s a problem like a short circuit, and the power starts getting sucked through the wires at dangerous levels? Well, eventually the wires will melt. That sort of solves the problem because now the power won’t flow any more but it also creates other problems, like potentially starting a fire. That’s what fuses and breakers are for. You can think of fuses as a piece of wire that’s designed to melt before the cables in your van get too hot. If the power running through the cable is at safe levels, the fuse does nothing. If the power is being sucked through too fast, the fuse melts so that the power can’t flow any more. Breakers do a similar thing, but rather than melting, they automatically trip a switch. We used fuses in several places around the system too. The power from the battery flows through a massive 500 Amp fuse. That’s to protect the battery from being sucked completely dry by a short-circuit across the main power terminals. If that one blows, we’ve got major problems but it should at least prevent massive catastrophic damage to the battery or to any people in the area. After the 500 Amp main fuse, power flows to the inverter, which has its own internal 150 Amp fuse. Power also flows to the DC panel. We put a 75 Amp fuse in line with this power cable. At the DC panel, each circuit in the van has its own breaker, with fuses ranging from 30 Amps down to 5 Amps. Each one is sized to protect the wires in the circuit. The solar charger has a built-in 75 Amp fuse to protect the charger from any issues in the solar panels. Even the battery monitor cable as a 100 milliAmp fuse to protect it. I already mentioned the 30 Amp breaker at the 120v AC distribution panel. This feeds into three 15 Amp breakers for each of the three AC circuits in the van. Yes, 3 x 15 Amps is more than 30 Amps, but the idea is that each of the individual circuits can take 15 Amps of current so that’s the level of protection they need. The main cables to the AC panel can safely take 30 Amps, so that’s the level of protection that they get. Each of these fuses and breakers is designed to protect the wires in the system. Everything that is plugged in at the other end of the wires also needs to have its own fuse to protect the equipment. It might seem like overkill, but the point is to not get killed. Electricity can be dangerous if it short-circuits. The fuses provide a level of protection against this. Main battery switch, Heavy Duty, Blue Sea 3000 from Amazon. 500 Amp ANL Fuse, Blue Sea 5137, in an ANL fuse holder Blue Sea 5503. Buy the fuse holder and the correct size ANL fuse. EV200 relay that lets the battery management system disconnect the battery if it senses an overcharge or undercharge event. This came with the battery and battery management system. Buss bars, 600A, Blue Sea 2104 from Amazon. Dual-circuit battery switch, e-series, Blue Sea 5510e from Amazon. This one switches both the positive and negative wires that come from the solar panel. Single-circuit battery switch, e-series, Blue Sea 9003e from Amazon. This one supplies power to the DC distribution panel. MRBF Terminal Fuse Block, Blue Sea 5191 from the buss bar to the DC distribution panel. The fuse holder mounts in-line with the cable so it’s very compact. Make sure you buy both the holder and the correct size MRBF fuse. We used welding wire for the thick cables, 4/0 AWG from the battery to the buss bar and on to the inverter, and 2 AWG to the DC distribution panel and to/from the solar controller. It’s very flexible, made up of lots of very thin copper strands. It works well in tight spaces. For the thinner cables to each of the 12 volt outlets and devices, we used 10 AWG cable. I bought some Coleman brand stuff and it worked out well despite being pretty cheap. I also bought some pricier Ancor marine grade 10-gauge cable. It’s nicer to work with because it’s more flexible and the strands are all tinned to prevent corrosion. Be careful – there’s some really cheap cable out there, but it’s copper plated aluminum which is NOT good for this type of application. For the lighting runs, I used some 16 gauge speaker wire that I already had. The lights draw very little power, so they can use much thinner cables. In the electrical panel area, you’ll also see an amperage measuring shunt (PDF) which comes as part of the Victron battery monitor. It connects to the negative terminal of the battery before any of the other loads are connected, so it can measure all the power going in and out. The breakers need to be more accessible than the fuses, because they are more likely to trip than the main something-is-really-wrong fuses. That’s why they are all mounted in their own panel. The top set of switches is the DC 16-position distribution panel. Blue Sea 8377 from Amazon. It comes with 15 Amp breakers, so we had to buy some individual ones at the other ratings we needed. Next is an AC 6-position distribution panel that also contains a main circuit breaker. Blue Sea 8027 from Amazon. We are only using three of the circuits on this panel. I bought one with more circuit spaces “just in case.” That wasn’t a smart idea. I’m never, ever going to rip all this stuff apart to add more cables. At the bottom is the AC 30-amp main only circuit breaker that switches the shore power inlet on and off. Blue Sea 8077 from Amazon. There’s also a little switch just above the battery monitor in this section. It controls the backlight behind all the labels on the distribution panels. We didn’t want that light glowing all the time, but it’s handy if you are troubleshooting. The push button on/off switch lights the labels up when you need them but saves a tiny bit of power all the rest of the time. I was even thinking about getting some light dimming labels to go over the remaining LEDs on the panels. By the way, don’t necessarily use our fuse ratings if you are building your own system. 500A is a very high fuse rating, but we have a very big battery. All the other ratings depend on the wires you use and the loads you expect to run. Do your own calculations. Blue Sea have a great online tool for this. It looks a bit daunting to start with, but once you start feeding numbers in, you’ll start to see what size cables and what size fuses you should use for each area of your system. So, are you using inline fuses at the ‘other ends’? So everything has a breaker or fuse in the back AND a fuse near the appliance/light/pump? The breakers/fuses at the control panel are sized for the wires you use and for the maximum load that might be put on that circuit. Things that you plug in on that circuit might have a different current rating. For instance, we’ve got 15 Amp breakers on our 12v outlet circuits. That’s going via 10 gauge wire to a couple of cigarette lighter sockets mounted to the walls. If I plugged in a cell phone charger, that might have a 2 Amp maximum rating. If it short circuited, the 2 Amp fuse would protect things. If I relied on the breaker, it might not actually trip before the short circuit heated up the wires or internal components in the charger enough to start a fire. In that case, the fuse is built in to the cell phone charger. When that isn’t the case, we’ve added suitably sized fuses for the permanently attached items in the build. For instance the Victron Color Controller is attached to one of the 12v outlet circuits. That’s a 15 Amp circuit but the controller wants no more than perhaps 2 Amps (I forget the actual value) so we put a fuse in line for the controller. On the other hand, we have a dedicated circuit for our water pump. We put an appropriately sized breaker on that circuit. That means we don’t need a second fuse at the pump end of things. Same thing with the lights – the circuit that they are on has a smaller breaker so we don’t have to put a fuse in-line for every light fixture. It’s a trade-off. Either you run more cables and have more breakers/fuses at the control panel, or you run less wires but add fuses at each appliance. 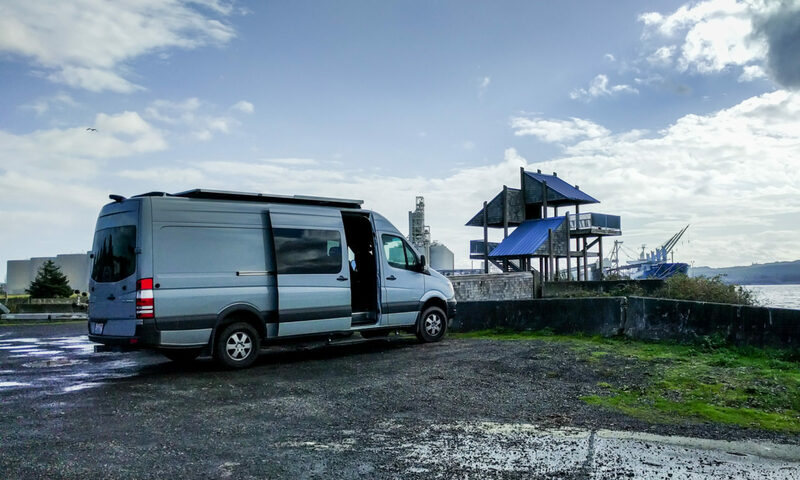 We chose to put as many breakers as possible in a place where they are easily accessible (at the control panel) rather than spread throughout the van. Hey, are those flat bar connections (right where the (3) is, and between the (10) and (4) ) did you make those or did you order them? I’m interested in mimicking them in my set up as it looks like it helps with cable management and allows to make things in much closer quarters and wondering how I could emulate those. You’re welcome! Glad you found the answer. This site is becoming harder to navigate now there’s so much content. Might have to do some rearranging or at least start integrating the answers to questions from the comments into the original articles. Thanks for getting back to me I really appreciate it. 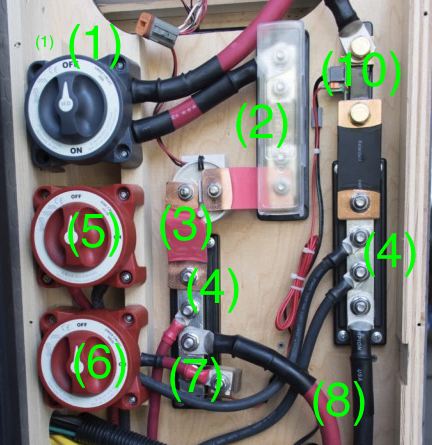 I found someone to help out with building my electrical system in my van Im looking forward to learning more about how it all works.How did you figure you need a 500 amp ANL fuse to protect your batterie bank is that based on the size of you batterie bank? I am installing a 300 amp hour GBS batterie bank. Thanks again for all your knowledge and help. The 500A fuse is calculated based on the maximum current that the battery should ever be asked to produce. If something in our system was pulling more current than that, it’s most likely because of a problem like a short circuit. So that 500A fuse protects the battery from being charged or discharged too quickly.